Your new site looks GREAT on any modern device or browser. Smart phones, tablets, laptops, AND desktops. No kidding. You only get one shot at a first impression. Your IDX site is dressed to impress! Interact with your prospects and clients. And watch them share your website with friends and family via social media! 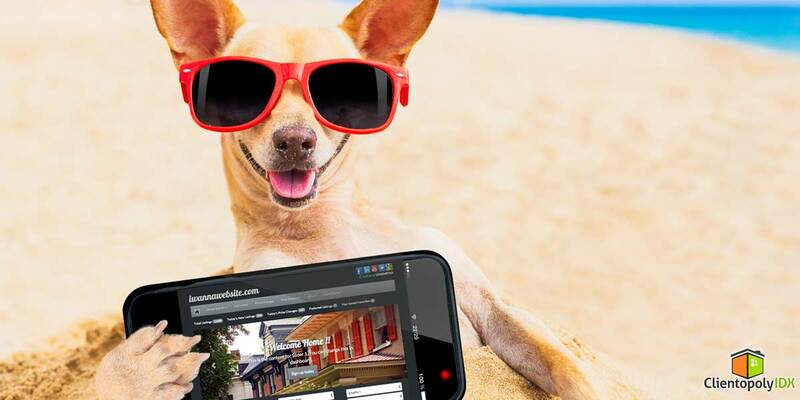 Your new site will show off the latest IDX features...the go-to functionality that buyers and sellers want! Your personally branded IDX Website! More than 50% of all web browsing is done on mobile devices. Don't miss out on half your visitors, prospects, and clients. Your new site will look GREAT on all modern devices! Put your best foot forward with a sleek, new design that earns the respect and trust of potential clients. It's super-easy to make your site uniquely branded for your real estate business. And no, you don't have to know "computers!" Industry-leading lead capture helps turn prospects into clients. Easily change your forced signin settings, too! Your prospects and clients are automatically notified re: new listings, price changes, photo changes for favorite listings and saved searches. Choose from one of our many designs. Simply select your favorite after you purchase your Clientopoly IDX agent website subscription. 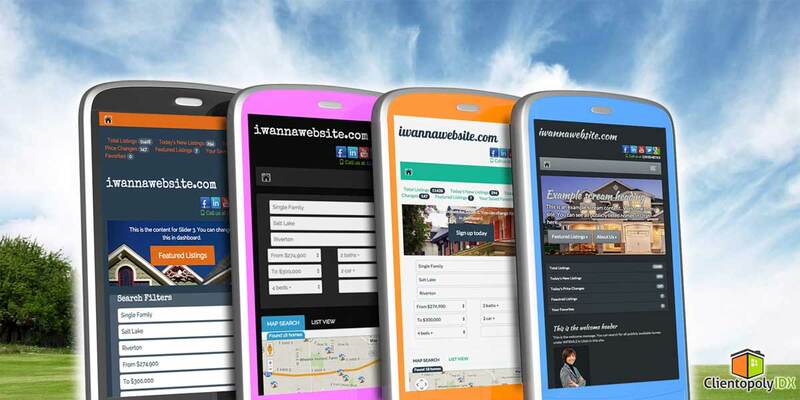 Your clients and prospects will LOVE your website on any modern browsing device! Just click and type. Easily add text and photos...even videos. EASY! Make it your own by selecting a color scheme that matches your look and feel, your branding, or both. Fully integrated Google Map search. Just drag the map to change search areas, or use the intuitive search filters. Search results are instantly displayed, with no need to click a "Submit" or "Update" button. Who's got time to wait? Our sites load quickly so your prospects and clients will want to come back again and again. We've got the easiest property markers and informative information bubbles on every property. There's no easier way to browse listings on a map. Your regulars will love how your site groups all the latest price changes together. Choose a luxury style, an informal style, or an authoritative style. We have beautiful fonts from which to choose. Get found more easily on popular search engines. Our sites are built from the ground up to help improve search engine rankings and listings. All publicly searchable homes, condos, and townhomes are updated daily and ready to be searched easily. Add your own links to social sites. And your website visitors can easily share links on their own social media outlets. Every listing is automatically signed a unique QR code that points people back to your website. View/edit your prospects and clients while maintaining current information for each. Get notified the instant people sign up on your site so you can follow up with them immediately. 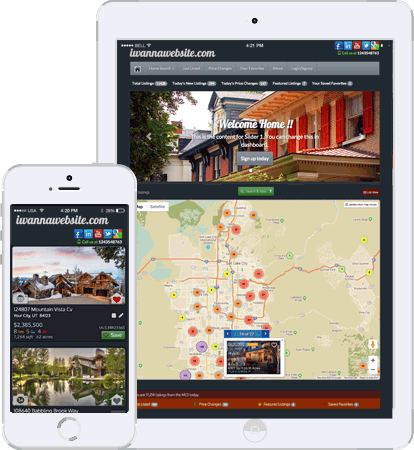 Showcase your featured listings automatically or quickly add any listings from your IDX feed. Listing pages automatically showcase similar listings that are similar in price, type, and area. Your regular visitors will really enjoy the "New Listings" link, taking them right to the hottest new listings available in your market. No setup fee. No contracts. Cancel anytime. PRICE GUARANTEE: If you can find any Realtor IDX website service for less money and all the same features we offer, we will match the price! Gone are the days when "having a website" was enough. To thrive in today's real estate market, we've got to put our best foot forward. We've got to provide an excellent experience for our prospects and clients. We've got to show that we know what we're doing, and that we are willing to help. All calls and emails are handled in the order received. Email works great, too!